Two new buoys have been deployed around Bermuda to contribute data to BIOS’s Bermuda Ocean Acidification and Coral reef Investigation [BEACON] project. The buoys are fitted with instrumentation which will measure in situ seawater temperature, salinity, dissolved oxygen, turbidity, chlorophyll, pCO2 and pH every three hours. 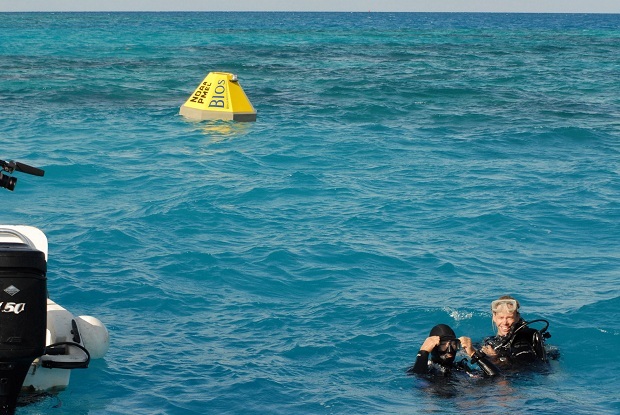 In early December BIOS researchers deployed the buoys at Crescent and Hog Reefs. The technology has been developed by the National Oceanic and Atmospheric Administration Pacific Marine Environmental Laboratory for studies of coastal air-sea carbon exchange. The collaboration is part of a global network of carbon dioxide and ocean acidification time-series observations. By cross-referencing the information from the buoys with BIOS’ research on coral calcification rates at Hog and Crescent reefs, it will be possible to develop a better idea of how corals are responding to physical and chemical changes in the environment. BEACON is a relatively new project for BIOS. It seeks to record and analyse the effect of ocean acidification on corals at a range of spatial and temporal scales. The project, which received generous seed-funding from the US National Science Foundation, is ambitious but potentially far-reaching. The information and observations that are gained from this project will serve as important guidelines on how coral reefs in Bermuda and elsewhere may respond to ocean acidification.